Did you miss last weeks After the School Bell Webinar Series: Growing Advocacy Champions? Have no fear, we have the recording! Learn how to create a state coalition that advance more equitable outcomes for children and youth through the community school strategy, with Ellie Mitchell, Executive Director, Maryland Out of School Time Network (MOST), and Alexandria Warrick-Adams, Director, Elev8 Baltimore. Did you miss After the School Bell Webinar Series: The Guardians? We have the recording! Learn how to use the community schools strategy to transform schools and mobilize leadership to leverage assets from within their communities to support student learning. Listen to Community School Superintendent Leadership Award winner, Dr. Matt Wayne, of Hayward Unified School District and Community School Initiative Leadership Award winner, Jill Pereira, Vice President of Education at the United Way of the Greater Lehigh Valley in Allentown, Pennsylvania. 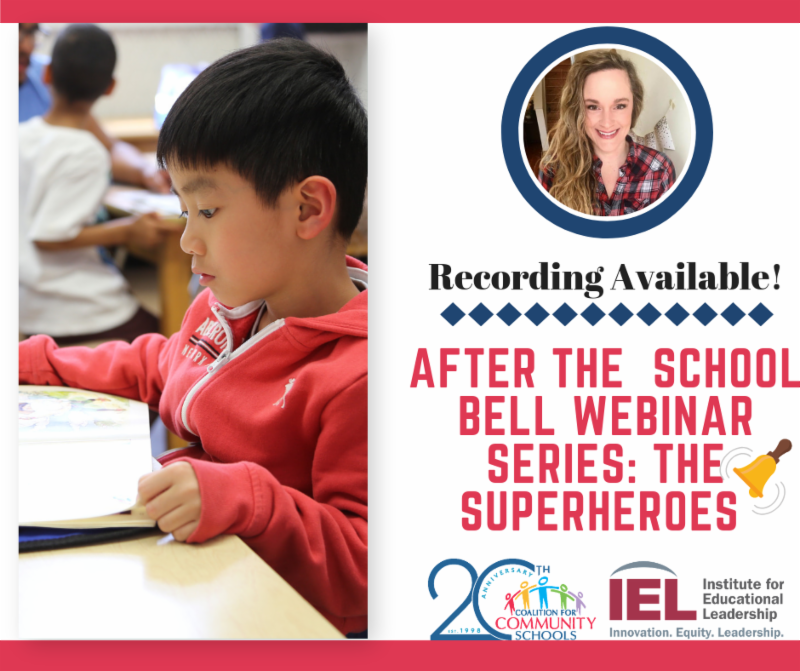 Did you miss last weeks After the School Bell Webinar Series: The Superheroes? Have no fear, we have the recording! Learn how to build powerful relationships with students, from Hallie J. Atwater Community School Coordinator Leadership Award winner and Coordinator at Renaissance Academy High School. 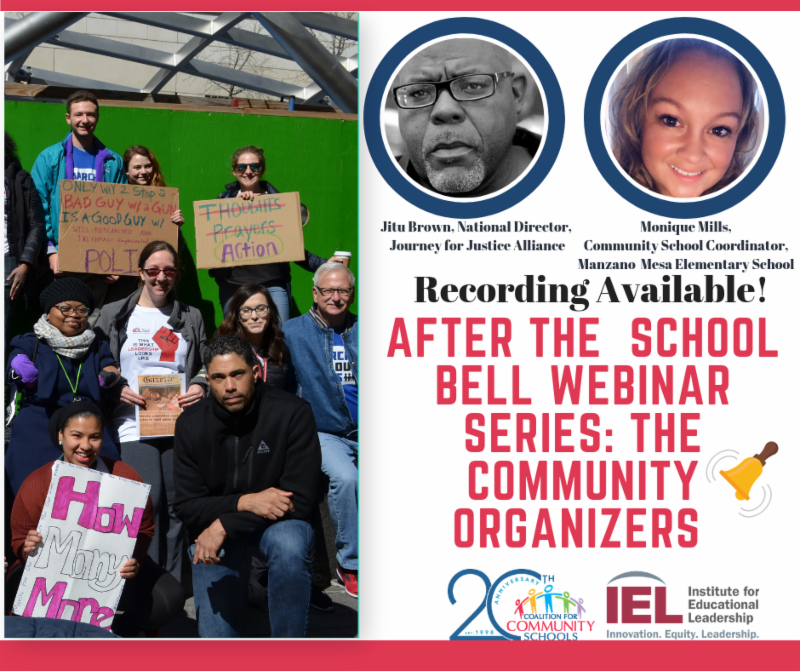 Did you miss last weeks After the School Bell Webinar Series: The Community Organizers? Have no fear, we have the recording! Listen to Jitu Brown, National Director, for Journey for Justice Alliance in Chicago, Illinois and Monique Mills a parent who now serves as a community school coordinator talk about how to engage parents and start a grassroots campaign for community schools. 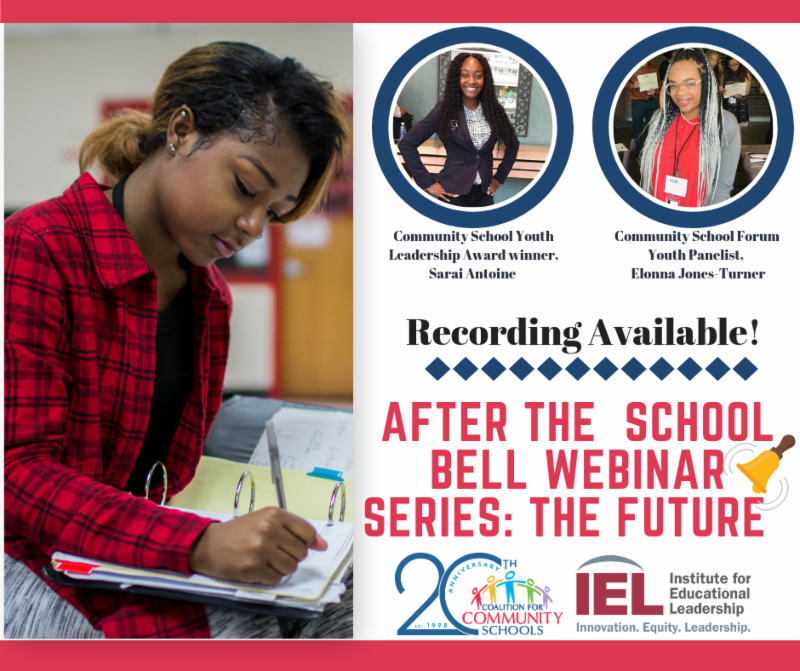 Did you miss Wednesday evenings After the School Bell Webinar Series: The Future? Have no fear, we have the recording! Listen to Community School Leadership Youth Awardee, Sarai Antoine and Community School Forum youth panelist, Elonna Jones–Turner talk about their experience at their community school. They also shared tips on how leaders can successfully connect, empower, and prepare students to excel after they graduate. 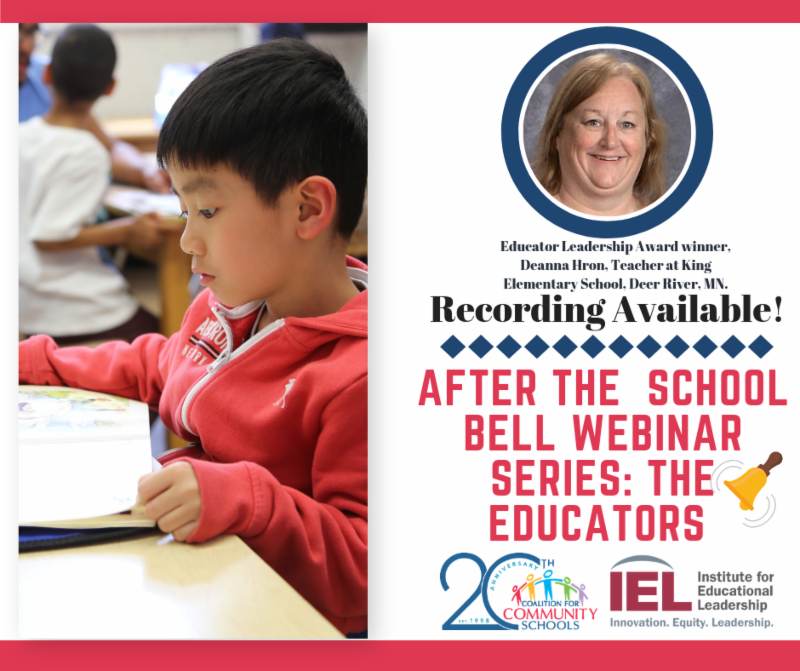 Listen to After the School Bell Webinar Series: The Educators. Community School Educator Leadership Award winner Deanna Hron, a former teacher and now Coordinator at King Elementary talks about her dedication to advocating for students by pushing forward the "Vote Yes" referendum. November 2: Session 1 - A school, an intermediary, a community: What does a scaled up system of community schools look like? What Does the Federal Stimulus Package Mean for Community Schools? Why Are More Policymakers Supporting Community Schools?